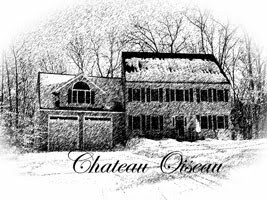 Chateau Oiseau: Lysozyme added....talk to me in May! Lysozyme added....talk to me in May! Well, now that the wine has been racked and sulfited lightly, today it was time to add lysozyme. Four ounces of 5% solution was added to the carboy. This naturally-occurring enzyme (which can be found in egg whites, among other places) kills bacteria by breaking down the cell walls. The main purpose of using it is to kill off the malolactic bacteria, so they do not become active again later, potentially producing CO2 to pop the cork out of a finished wine in a bottle. In theory, there should be no more malic acid in the wine, so the malolactic bacteria should not "come back to life" but you can never be sure what will happen if you give someone a bottle of wine and they store it in warm conditions (improperly!) and there is a smidge malic acid in there. So the best course of action is to kill off all the bacteria in the carboy with the lysozyme. Now, I will let the wine sit for 3 months, so don't expect anything new until May! On the bright side, I just ordered 250 pounds of fresh Chilean grapes from Beer & Wine Hobby in Woburn MA for delivery in May. Who knew I was 20 minutes from one of the largest beer and winemaking stores on the east coast?? I just found it a few weeks ago (thanks Mia!) They bring in fresh Chilean grapes in the spring and fresh California grapes in the fall. So I'll be starting two new cuvées of wine in May--another pinot noir and a malbec!